She was amazing, super thorough, explained everything clearly and detailed. Will definitely be going back and highly recommendher to anyone, great doctor!! Grace Wu is a compassionate and family-friendly ophthalmologist in Orange, CA. Dr. Wu attended medical school at Northwestern University in Chicago, where she also completed her internship in internal medicine. She completed her ophthalmology residency at the same institution, where she was a chief resident. Dr. Wu is a part of Medical and Eye Clinic and is a member of the American Academy of Ophthalmology. Patients see Dr. Wu for a variety of reasons, including general eye consultations, vision loss, and pediatric eye problems. She welcomes patients who speak English, Spanish, Chinese, and Taiwanese. Her awareness of these languages makes her accessible to patients from a variety of backgrounds. 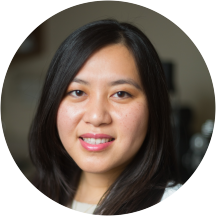 Dr. Wu treats a range of conditions, and she is eager to help the wider community receive the care they deserve. She gives each patient her focused attention, and she prides herself on delivering the best treatment available. Dr. Wu was incredible and explained everything so well. She made me feel cared for and didn’t talk down to me, yet was so knowledgeable and up to date on current research. However, the office is badly run by the employees.I made my appointment but was called and asked to come in a half hour earlier, yet waited an hour and a half to be seen. The card reader wasn’t working. I was led to one room, then brought to another, then brought back to another, then it felt like I was forgotten for a minute. Everyone was very nice, but the staff need training on how to structure appointments and communicate with patients. Great doctor. Nice and informative. I will definitely go back again. I would recommend her to anyone. Don't be afraid about the outside of the building. The inside is nice and clean and the staff is very friendly. Wait time wasnormal for a doctors office. Make sure to have a check or cash they do not accept credit card. This was first time seeing a real eye DR (compared to urgent care or Lenscrafters) and it was amazing. Dr. Grace Wu took the time to really figure out was wrong with me rather than looking at me for 1 minuteand prescribing meds. She was so friendly and very professional. I will definitely go back to her and refer all my friends/fam. Dr. Wu was very thorough with the eye examination and also in reviewing my medical history. Excellent bedside manner and easy to talk to...great doctor! This doctor would have been nice to go to if her office isn't managed so poorly. This practice is the most disjointed office that I have ever encountered, and I would definitely avoid going to it again. Save yourself from the headache and wallet drain by seeing another practice instead.